FWIW, I hate “flash” photography. It really brings out flaws and false contrasts, IMO. To the eye, my corner lid fix does not have that much contrast. 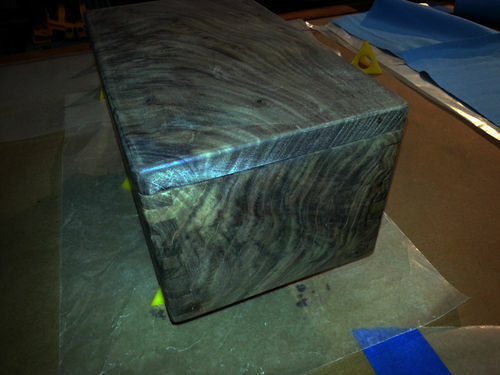 I wet with denatured alcohol to clean of dust and to be able to see what the box looks like with a finish. Things look better than these images, so now I need advice on a preferred finish. I have used all of the above, HOWEVER, I have not used West Systems Epoxy as a finish. I used to vacuum-bag Obechi and fiberglass onto model aircraft airfoils with the stuff, but that is a whole different animal… Have not used epoxy as a paint-on finish. I am assuming that the epoxy has to be buffed out after applying right? Any suggestions out there? What finish would do the Claro Walnut the most justice? Hey, Mike, that is a nice job on the fix. It isn’t on your list of readily available options, but I really like Danish oil followed by Deft rattle can gloss spray lacquer followed by paste wax. Whatever you do will look great with that beautiful Claro. Good luck! If you wanted to try epoxy (which I wouldn’t) you are going to want to apply a UV blocking finish over the epoxy. Over time, epoxy will yellow from exposure to sunlight. I used it on my wood kayak and it is a very hard covering. There are several coats of marine grade polyurethane on top of the epoxy. 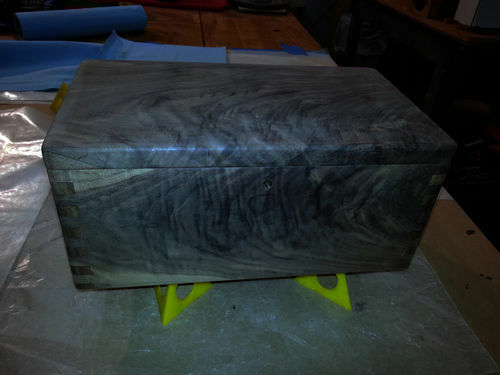 And yes, epoxy will need to be sanded and polished before adding a final finish. Any of the other finished you list will work. 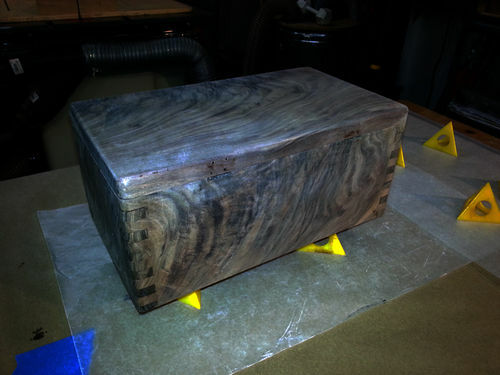 I use a water based polyurethane for last few projects. Art’s finishes always look great – I’m sure he has a solid recommendation. BTW – I think the repair turned out great! I had forgotten about Deft Finish. I do like that finish. I prefer to use General Finish products my self. In the past I have liked danish or tung oil because after some time you can just hit it again with a new coat of oil to make it look like new again. I have had great results with that myself. I hate Flash too… BUT, you should have a good light on the subject… you can then take sheets of white paper pasted on cardboard and place the cardboard around to Bounce the Light to the Left and to the Right, etc. to get the subject fully lighted… Your picture has only one focal point… the one closest to the light. I have always had very good luck with dewaxed Blonde shellac… maybe 5-6 thin coats until you like what you see as GOOD… Applied with a rag ball, applying a thin coat… Do not go over the coat while still wet… Wipe it on and leave it alone till dry (in a few minutes)... then apply the next coat, etc. ... Each coat will be blended into the previous coat, building one NICE coat! You can put any number of coats on it… You will be able to tell when you see what you want… then stop. If you ever think it need a Touch Up… Apply more wax, etc. OR Wipe off the wax with Paint thinner and just apply a few more coats of Shellac! etc. etc. I had forgotten about using Deft ( I think I still have a can of it in hand). 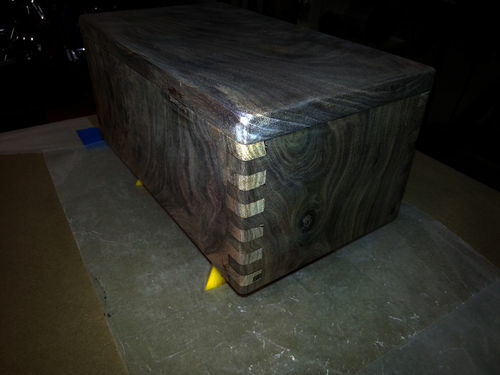 I used Deft on my hand plane totes and knobs and it worked well. That being said, I will probably use my MW Tung Oil Finish (wipe on varnish) and then finish up with 600-grit and a final coat of Deft. 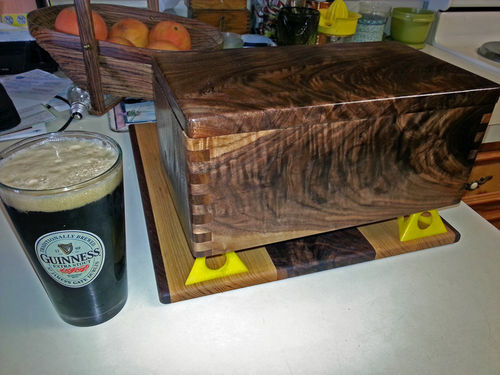 I have already used shellac on two large projects, and while I like the looks the durability is somewhat lacking. Even though re-finishing is easy enough I think I want greater durability on this one. Have any of you used the spray-on flocking to line the bottom of your boxes? Using this adhesive. It is a pretty simple process so whatever you use should turn out very well. When doing an inside corner spraying has some areas where it can get a very light coating of fiber… I have simply applied glue and then used a standard applicator to apply the flocking material. It always went well. I am sure the stuff from Grizzly will work just fine. I am sure I used tight bond glue myself. So let us know. I’m not going to give my input on finishing because I’m not that experienced. Just want to say try NOT using a flash in the pics. Or take it outside in natural light. I wanna see that Claro in proper lighting! I m not going to give my input on finishing because I m not that experienced. Yeah, I should know better about using the flash. BTW, I am on my 3rd coat of MW Tung Oil Finish and the wood is still sucking it up. It may end up taking 6-8 coats before I can move on to Deft spray lacquer for the final shine. Places where it is still sucking up the finish are dull while other areas shining. Time will tell. Just got the order for flocking off to Grizzly. Ordering Black and Brown for now. Truth be told, the various textures of Claro Walnut really do act differently and will take quite few coats to completely fill the grain. It is nice to see the grain starting to pop now. I am now up to 8-coats of MW Tung Oil Finish. I buffed with #000 steel wool on coats 3 and 6, so what you see here is 2-coats after the last buffing. What looked “filled” now appears to have the pores again sucking up finish. Does anyone know if this wipe on varnish dissolves earlier coats and reopens the pores? Would it be prudent to start spraying on lacquer at this point? IMHO… YES… after several days (maybe a week or two) to let the oil fully cure… in order to prevent any future problems. Thanks Joe. Are suggesting a light buff/sand (#000 or 600-grit) with maybe BLO, and then let the BLO & sanding dust dry/fill-pores before lacquer? I have some 1500-grit for final polishing once I can get all these pores filled. BTW, each coat had at least 24-hours between each new coat. 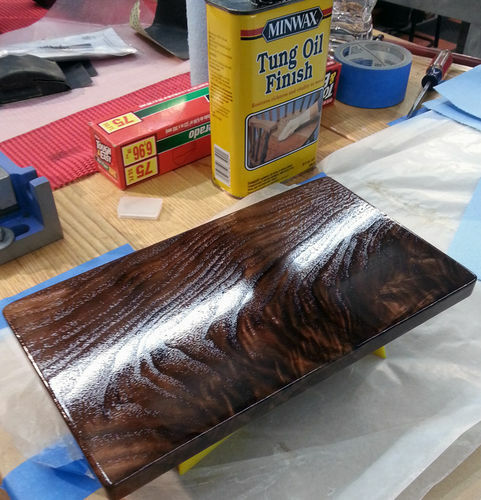 Well Joe, after 15-20 coats of wipe-on varnish, I sprayed my first coat of lacquer today. The box looks pretty good, but the top wrinkled. Looks like I will have to start over on the top… 8-( Oh well. Over all, I think this is coming along, though far from perfect. Great learning experience, but the patience is wearing thin and I want to get-r-dun already. I am holding off starting another box because of the introduced dust and the like.